Richard Milhous Nixon, 1913–1994. 37th President of the United States. 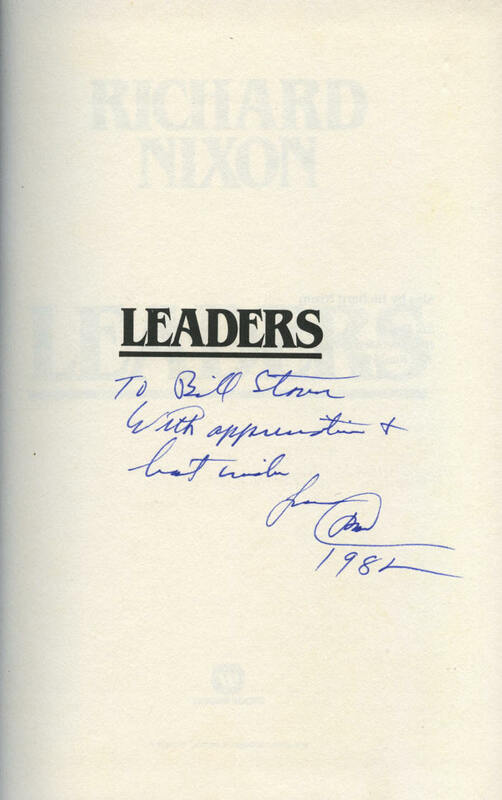 First edition hardbound copy of Nixon's fourth book, Leaders, boldly inscribed and signed on the half title page To Bill Stover / with appreciation & / best wishes / from / RN / 1982. With dust jacket. The Watergate scandal forced Nixon to resign the presidency in 1974. In the 20 years between his presidency and his death, Nixon wrote nine books, including Leaders, and reestablished himself as a respected statesman. In Leaders, the third book of his post-presidency, Nixon brings readers face to face with world leaders he had known, including Winston S. Churchill of Great Britain, whom he called "The Largest Human Being of Our Time"; French President Charles de Gaulle; West German Chancellor Konrad Adenauer; Soviet leader Nikita Khrushchev, with whom Nixon had the series of impromptu, hard-hitting ideological debates, dubbed the “Kitchen Debate,” covering the range of Soviet-American relations, in 1959; Khrushchevʼs successor, Leonid Brezhnev; Communist Chinese leaders Mao Zedong and Zhou Enlai and Nationalist Chinese leader Chiang Kai-shek; and American General Douglas MacArthur and Japanese Prime Minister Shigeru Yoshida, the co-architects of post-World War II Japan. The dust cover appropriately says that Leaders “is the view of a man who himself has held the reins of power—one who knows the feel of those reins and the awesome potential of leadership for both disaster and progress." It is a book, it says, that “no one but Richard Nixon could have written. It is at once as personal as a handclasp and as objective as only so earnest a student of history could have made it." This is a stated first printing of this book, which was published by Warner Books in 1982. The full 10-to-1 number line appears on the copyright page. Nixon has inscribed and signed it in bright blue to his good friend William W. Stover, with whom he kept in regular contact. Stover, a 1955 graduate of Stanford University Law School, served as the chief of staff for California Senator George L. Murphy. This book is in near fine condition, and the dust jacket is very good. The binding of the book is tight, and the text block is square and clean. The silver foil stamping on the spine is a little worn, and there are a couple of small dings to the lower right corner of the front board and a small, triangular shaped spot at the top of the back board that is slightly faded. The dust jacket is not price clipped. It has minor crinkling at the top and bottom edges on the back and two small tears, with slight paper loss, at the bottom corners of the front. Nixon's inscription and signature are bold. Collectors of Nixonʼs signed books should not over look this one. Our research has found only a handful of signed copies of Leaders sold since the book was published. Click here to see our large selection of Presidential items.